After manuscript submission the pre-evaluation by Editorial Board expert takes place. Basing on the novelty of the study, subject, methods and obtained results, the Editor-in-Chief decides whether to reject the manuscript or to accept it for further processing. 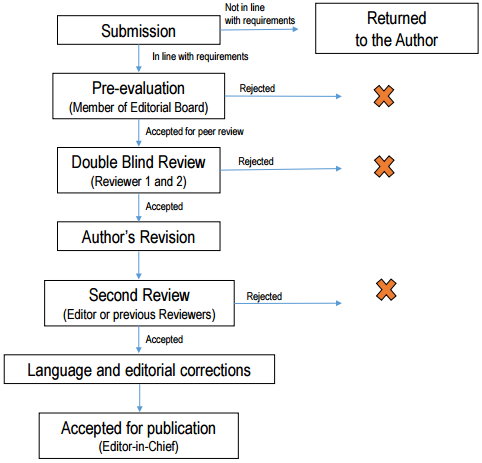 Upon acceptance, the manuscript undergoes peer review process which is based on Double Blind Reviews i.e. the reviewers (usually 2) and the author are anonymous to each other. The reviewers are asked to submit review and fill the ‘referee evaluation sheet’ in the JAFS Editorial System within 3 weeks. Next the manuscript is revised by the authors (3 weeks). After positive second reviews made by previous reviewers or editor, the paper is directed to language and editorial corrections (if required). The final decision about publishing the paper in the Journal belongs to the Editor-in-Chief.